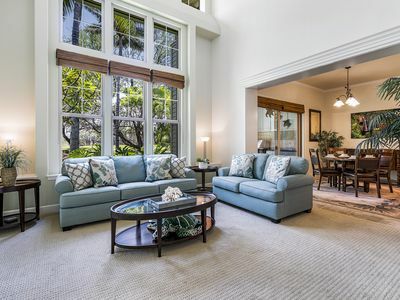 The Hawaiian word for family is ohana and we affectionately call our home, O2 or Ohana 2, as it is our family vacation home and we would love to share it with the you! 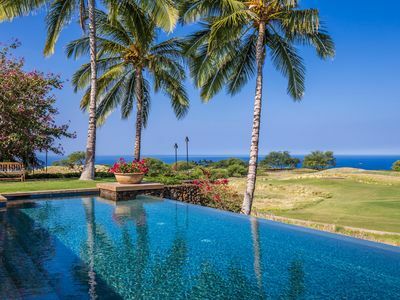 Marvel at the shimmering Pacific Ocean and tropical Kohala Coast views from our inside living space as it opens onto the lanai where you can just kick back, relax, swim in the salt-water infinity swimming pool (heated with no additional cost), enjoy the Hawaiian sunset from the outdoor dining area, and end the night stargazing from our spa sipping. Our luxury home has a seamless indoor-outdoor living plan. Recently remodelled and newly furnished in an open-concept style. Relax in our living room with comfortable seating to enjoy our large screen HDTV with cable, DVD, stereo system and Xbox 360 or sit at our games table adjacent to the TV area and play your favourite board/card games while listening to Hawaiian music. When you have won (or sadly lost) the last hand, move from the games table closer to the kitchen and sit at our O2 bar, one of our two granite topped islands in the kitchen. 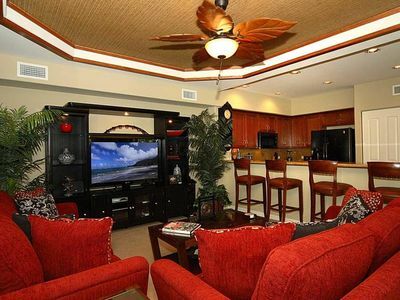 This bar/service area features a wet bar, wine fridge and elevated counter area that easily seats 4-6 family/friends. Enjoy cooking in our fully equipped designer kitchen with granite countertops throughout. There are two cooking "triangles" and our kitchen features a Viking range, Sub-Zero fridge, Bosch microwave and Bosch dishwasher. 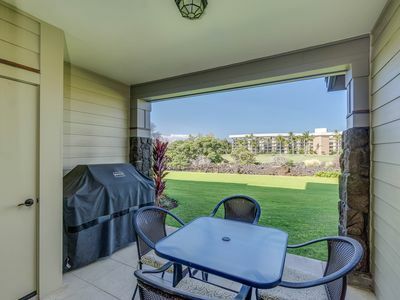 You can also prepare Big Island local fare on the outside gas grill on the lanai one step from the kitchen for your convenience. Of course, if you prefer not to cook the award winning restaurants of the Manna Kea and Hapuna Price resorts are at your service! We have a HDTV (on a swivel bracket) in the kitchen that you watch from the bar or the dining table. The dining table seats 8 comfortably. There are sliding patio doors on two slides of the dining area and a panoramic window on the third. 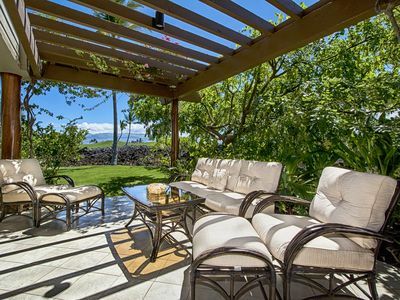 All outward views from the dining table are of the Pacific Ocean and Kohala Coast. 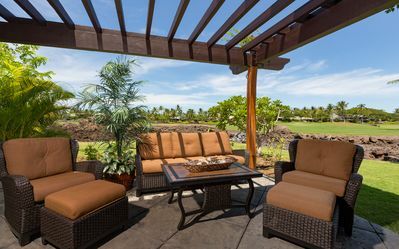 You can also enjoy your meals at the lanai dining table which seats 6. We usually dine with 8 easily and roll 2 chairs from the games table. 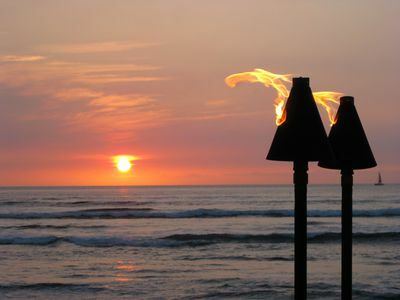 We enjoy watching the Mauna Kea sunset and the pool lights from the lanai dining area. We also have up-lit some of the palm trees in the back yard with beautiful effect. They are lit in a way that doesn't disturb the nightly galaxy of stars show! 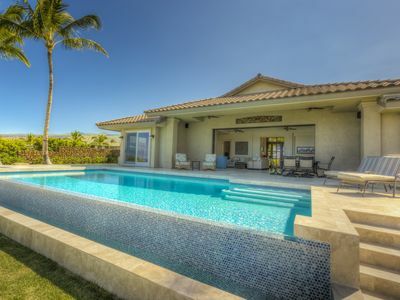 The house is air conditioned throughout (central air) and each of the beautifully designed four bedrooms have full bathrooms (three en-suite), ample closet space, and HDTVs. There is a laundry room at the back of the kitchen which houses a washer and dryer. You can also reach this through the double-car garage as it is a main thoroughfare into the kitchen from the garage. The master bedroom with a king size bed opens directly (2 sets of sliding glass doors) onto the back lanai with the pool and spa. 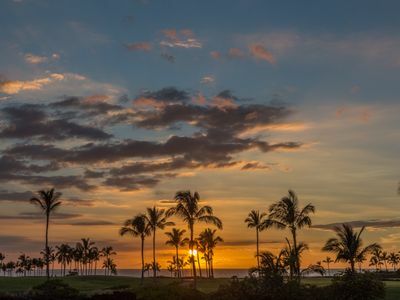 Wake up to ocean views along the North Kohala Coast with Maui majestically appearing in the distance. If you want to catch up on TV or Netflix, there is an HDTV on the dresser against the wall across the from the bed. The master bathroom has a double vanity, soaking tub, separate toilet and walk-in shower. One of the sides of the indoor shower is a glass door that leads into a private area with an outside shower and meditation bench. Many times in our stay, we use this as a place for all to shower off after a day at the beach before we jump into the pool or change for the evening. The second bedroom has a king bed and windows facing the inner courtyard. We find this the coolest and most ambient bedroom because of the location. The HDTV is nicely tucked away on a shelf inside the closet across from the bed and is easily accessible and visible when you open the mirrored-glass doors. It has an ensuite bathroom with a single granite-top vanity, toilet and a walk-in shower. The door for this bedroom is closest to the kitchen - best for those who want late night snacks ...or are last to bed! The third bedroom, which we call "the kid's room", features two extra long twin beds and windows facing the inner garden. There is an HDTV on the dresser against the wall facing the bed. This bedroom has its own door to the main bathroom with a walk-in shower, granite topped vanity and toilet. It doubles as the bathroom to the open area of the house. As this bedroom is closest to the living room, we find this room is best for the kids and those who like to stay up late gaming or watching TV. 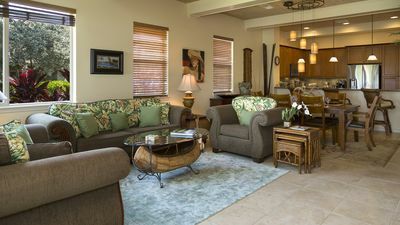 The Ohana Suite (a self-contained unit) has a private entrance and features a king bed, queen sleeper sofa, small living room, HDTV, walk-in shower, toilet, kitchenette with bar sink, microwave, fridge, as well as flatware, dishes and glassware. 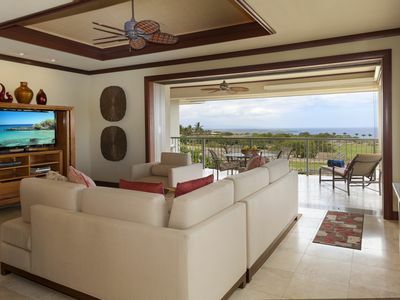 This suite has an air conditioning unit that is controlled separately from the main house for your own comfort. 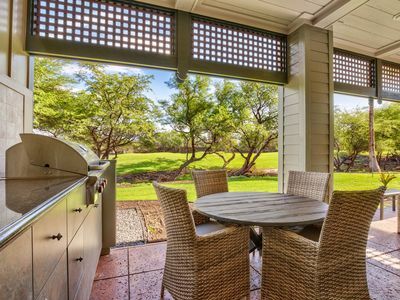 There is also a small private lanai that is frequently used by the Ohana suite family for early morning coffee. This suite is best for a family with young ones where the adults feel most comfortable with their children sleeping in the same room. Not only do we feel very comfortable in our home, we love O2 because of the view, privacy and serenity...and it has something for everyone. We installed a new pool surface last year and converted our infinity pool to a salt-water system. We find that this is much easier on the eyes, skin and bathing suits! We also resurfaced our shuffleboard court and spend a lot of time here in the late afternoon before dinner. Lawn encircles the property with play areas on all sides. We like that there is a lot of room to run and play. Guests ask us what we do during our time at O2. Some get up early and go to the gym. Some attend yoga class at Mauna Kea Beach. Some tee off. Some sleep in! We usually have breakfast around the O2 island bar and the kids head off to group lessons at the Seaside Tennis Club ($25 per lesson) with the adults in tow. 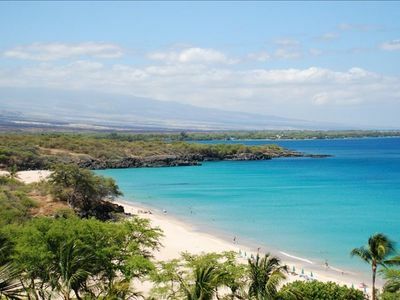 We then head to the Mauna Kea Beach (voted one of the top 10 beaches in the world) for the rest of the morning. 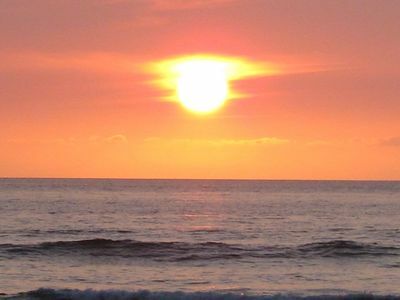 We also enjoy snorkelling there in the early morning or one of the neighbouring beaches. 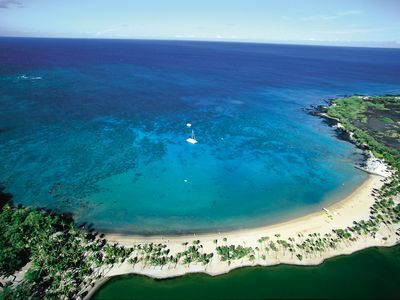 Many times we head to Waimea for lunch and to buy groceries for dinner. We love going to the Waimea Farmer's market on Saturday mornings. We usually spend the afternoons in our pool and then head to the beach for a swim before dinner. 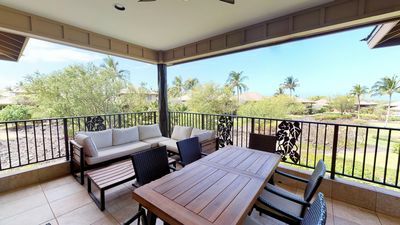 Dinner is on the lanai and we close the evening playing card/board/video games or enjoying the starlit sky from the spa. 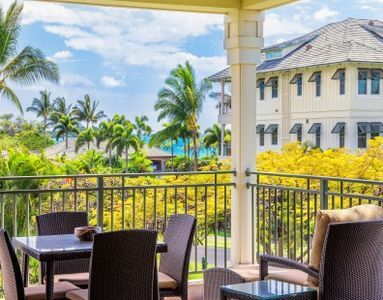 Because we have a membership in Mauna Kea Resort Services, you are eligible (with a $125 per day fee for the group) to enjoy all the privileges and amenities of the Mauna Kea Beach Hotel and Hapuna Beach Prince Hotel. This includes the sports club, spa, Seaside Tennis Club, 2 championship golf course, 2 beaches, 2 pools, resort restaurants, ocean activity center, kids club, business center, free parking and valet parking. 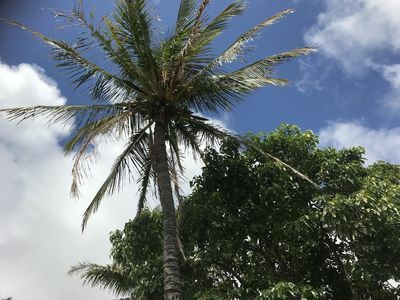 Come and feel the Aloha vibrations, enjoy all sorts of activities, shopping and magnificent restaurants of the beautiful Big Island or simply relax and enjoy our home. 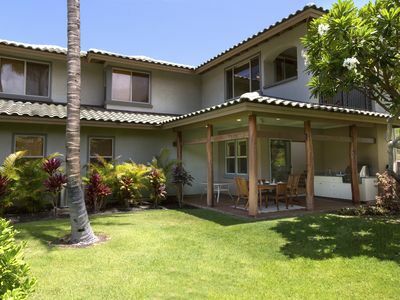 We want to make your Big Island stay at O2 a memorable one! 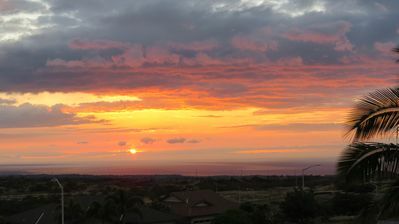 Waikoloa Village/Ocean View/Sunsets/Golf 3 Bedroom/3 bath $120 Per Night!